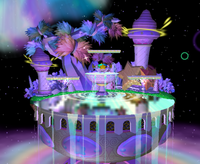 Fountain of Dreams is a stage appearing in Super Smash Bros. Melee, resembling the area from the Kirby series. The location is a recurring place in the series, as it houses the Star Rod, the single most important item in said series. It is available from the start, and serves as Marth's stage (with the Fire Emblem track playing) when battling against him in the Classic or All-Star modes and when battling to unlock him. Its appearance is similar to Battlefield. There are three floating platforms in the stage, with the two lower platforms occasionally sinking and rising from the water. The bottom of the stage can also be Wall Jumped off of, allowing for certain characters to use it as a recovery. Fountain of Dreams reappears in Super Smash Bros. Ultimate, with an updated design. Prior to its reappearance, its background music can be played on the Green Greens stage in Super Smash Bros. Brawl and the Dream Land stage in Super Smash Bros. for Wii U. 5/93 This mystical fountain in Dream Land uses the power of the Star Rod to create a gush of pleasant dreams that flow like water. The dreams then become a fine mist and drift over the land, bringing peaceful rest to one and all. It's been confirmed that there are identical facilities on other planets near Pop Star. This page was last edited on December 12, 2018, at 17:43.